Introducing Rollabowl – The Fun Fresh way to Fruit Display! Introducing Rollabowl – the fun, fresh and functional answer to displaying fruit. Designed to look fabulous in your home, whatever the style, Rollabowl is a modern alternative to a traditional fruit bowl. Whether you choose to keep it in the kitchen, living room or dining room, your new accessory will make a feature of your everyday fruit. 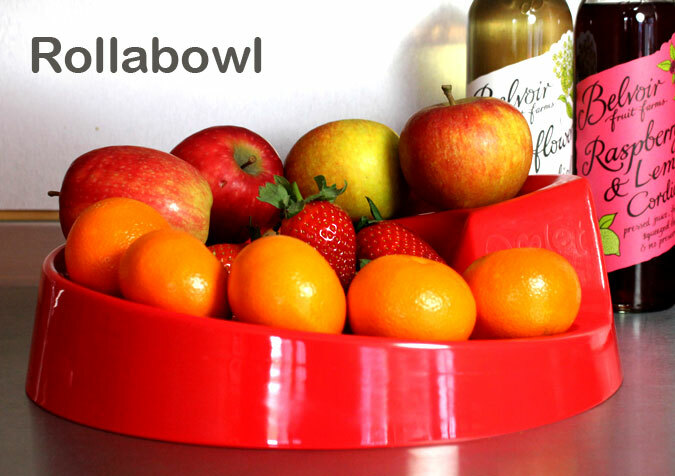 Not only does it look the part, but Rollabowl provides an innovative approach to storing fruit. Part bowl, part ramp, this is a fresh fusion of a product to keep fruit in top form. Separate your soft and hard fruit by utilising both spaces, and your delicate peaches and boisterous melons can live in harmony! Our design team are a clever bunch and they know that fruit bowls can sometimes get sticky. That’s why the Rollabowl is made from 100% melamine for quick and easy cleaning, and it is completely stain resistant. There’s no need to worry about damage from heavy fruits or clumsy hands because it is extremely durable, and the non-slip pads on the base are a handy addition. Plus, with four colours to choose from you’ll find one to suit your home! Pre-order your Rollabowl today for £19.99!